Lately, we’ve been on a hunt for new ways to incorporate eggs. In our family, we’re huge egg lovers, so naturally, it was one of the first foods that we introduced to our baby. We simply gave him some omelette strips (along with other foods, of course) and day after day, he downed them no problem. It was all fine and dandy until one day, he decided that omelette strips just weren’t his thing anymore. It’s like one morning he woke up and said, “Nope. Not today.” And this continued to happen everyday despite our efforts to help him love his omelette strips again. So of course, mama had to come to the rescue with some new creative ways to incorporate eggs. From the start, some of my favourite easy recipes to serve him that involve eggs as a main ingredient have been Pumpkin Banana French Toast Sticks and Mini 2-Ingredient Pancakes. But knowing that I couldn’t just serve him french toast and pancakes for the rest of his life, I decided to experiment with some new and fresh recipes, like egg salad, for instance. But not just ANY old egg salad. This five-ingredient avocado egg salad. So easy. So tasty. And perfect for the whole family! Okay, so first you’ll want to boil the eggs. The method I like to use to make hard-boiled eggs is to place the eggs in the bottom of a small saucepan. Cover the eggs with about an inch of water. Bring the water to a rolling boil and then remove the eggs from the heat. Cover and allow to sit for 12 minutes. Once the 12 minutes are up, remove the eggs from the hot water and transfer them to a bowl of cold water. This helps to stop the cooking process and also makes them easier to peel. Remove the eggs from the water, crack them a little and remove the shell. In a medium bowl, roughly chop up the eggs. Add a ripe avocado and mash together with the egg. Add a teaspoon of lemon juice, a half a teaspoon of garlic powder and two tablespoons of finely chopped chives (or sub in green onion). Season with salt and pepper, to taste. Serving it on whole grain bread with a few slices of tomato. You can either make it an open-faced sandwich or smoosh it between two slices! Serve it on whole-grain crackers with some extra fresh chopped chives to garnish. It looks fancy and makes a great appetizer or snack! For more of a breakfast option, you can serve it on a whole grain english muffin as a breakfast sandwich to go. If you’re watching your carb intake, serve it on a lettuce wrap. I like to use Boston or Bibb lettuce! Serve it on top of a spinach or romaine lettuce salad, loading it with extra vegetables of choice. Or just eat it as is! How long can you keep Avocado Egg Salad in the Fridge? 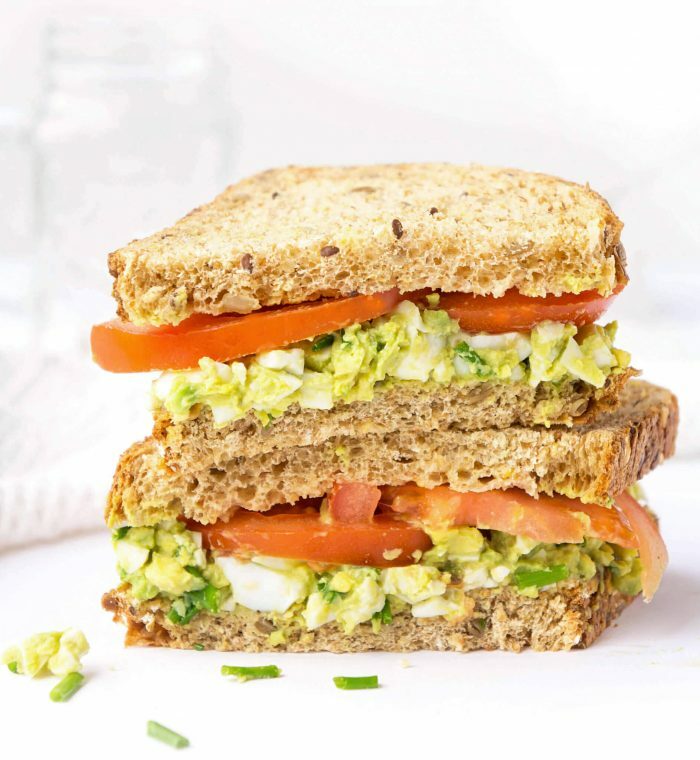 Because avocado doesn’t tend to last all that long before it starts to look a little funky, I would recommend eating the avocado egg salad within 1-2 days of preparing it. One day, I tried stretching it out for three days in the fridge and by the third day, it didn’t look too appetizing (but it still tasted good)! So for best results, eat it fresh and don’t store in the fridge for anymore than two days. 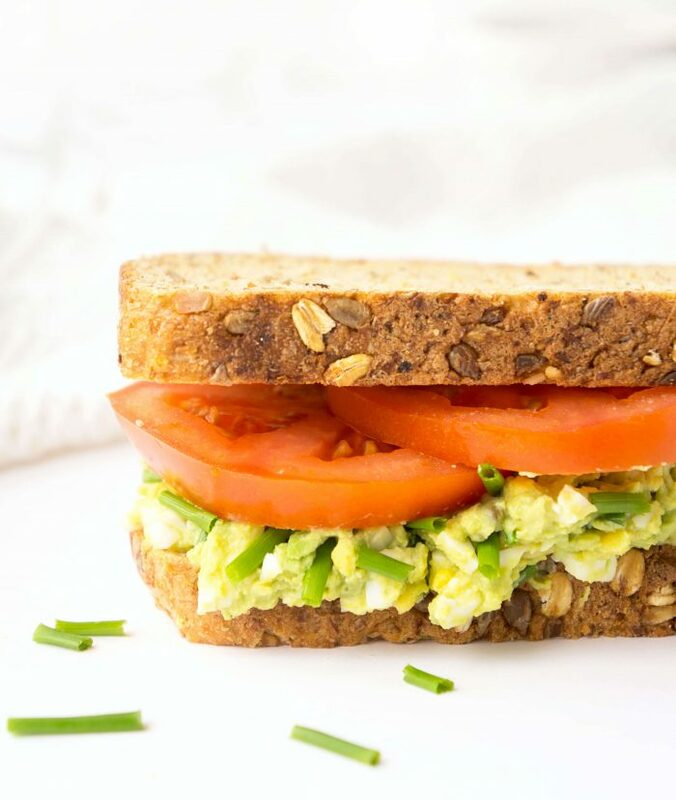 What are some of the nutrients found in Avocado Egg Salad? 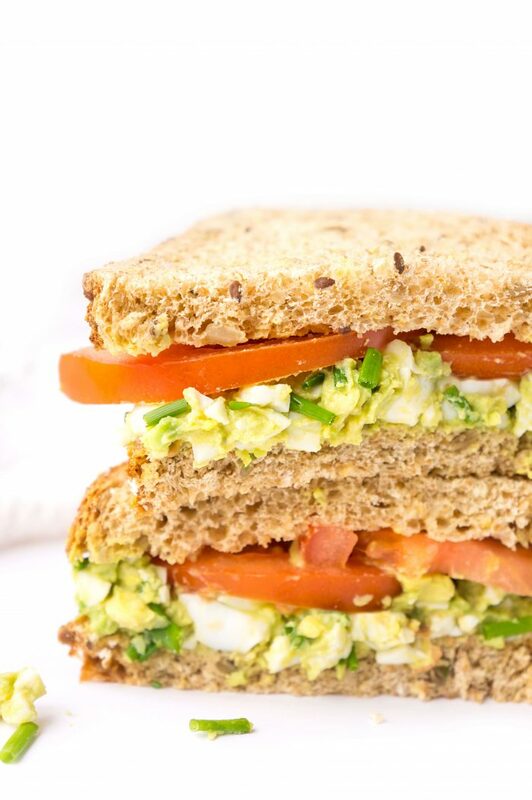 The amazing thing about this egg salad is that despite its short ingredients list, it’s packed full of nutrients! From the avocado, you get those healthy fats, in addition to fibre, vitamin E and potassium. The eggs are rich in protein, iron, choline and lutein. There’s also some vitamin D found in the yolk as well. Plus, it’s a lower carbohydrate option if you’re watching your overall carb intake. 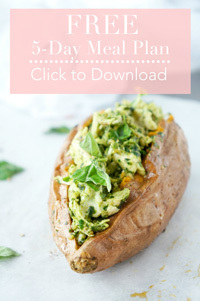 Not bad for a 5-ingredient easy-to-prepare snack or meal option! 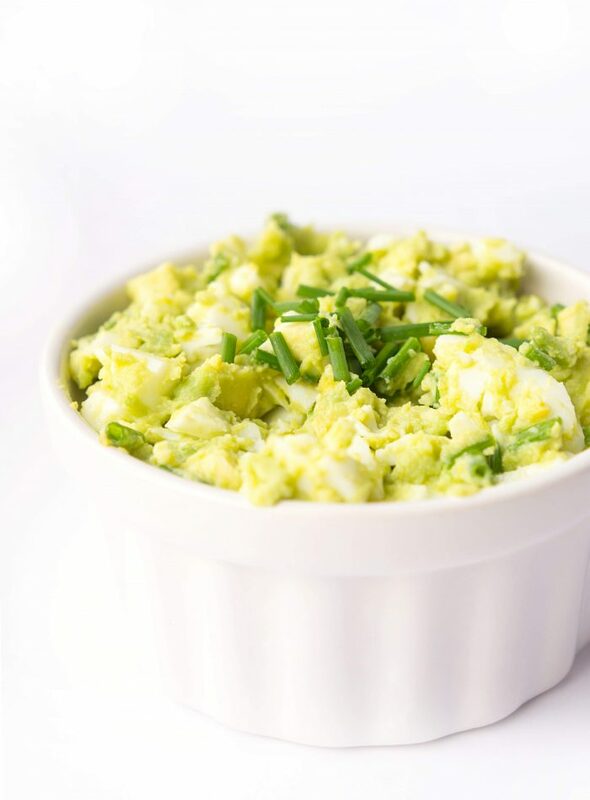 How would you serve up this avocado egg salad? Place eggs in the bottom of a small saucepan and cover with an inch of water. Bring to a rolling boil over medium high heat. Remove from heat, cover and let the eggs sit in the water for 12 minutes. Place the eggs in a bowl of cold water for a minute or so to cool (this also makes it easier to peel the eggs). Peel the eggs, removing the entire shell. Chop the eggs roughly and set aside. Place the avocado in a bowl and mash with a fork until creamy. Mix in the chopped eggs, lemon juice, garlic powder and chopped chives. Season with salt and pepper to taste. 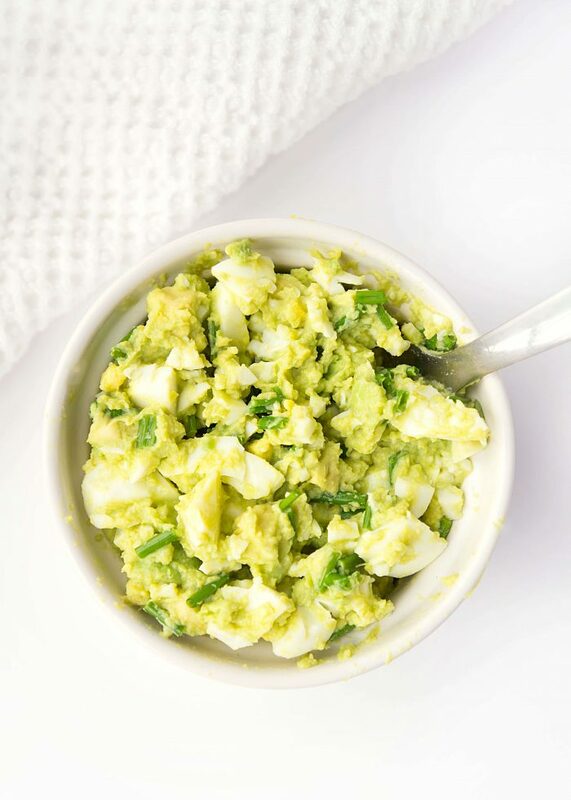 If you have a chance to make this Avocado Egg Salad, I’d love to see it! Tag me on instagram @hauteandhealthyliving and use the hashtag #hauteandhealthy!